Provide comfort for the family of Mary Kerr with a meaningful gesture of sympathy. 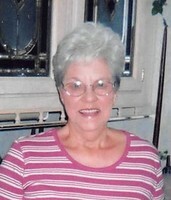 Funeral services for Mary Geneva Kerr age 84, of Branson, Missouri will be held at 10:30 AM, Wednesday, February 13, 2019 at Greenlawn Funeral Home in Branson with burial to follow in the Selmore Cemetery near Ozark, Missouri. She passed away on February 9, 2019 at her home in Branson, Missouri. Mary was born on April 5, 1934 in Ozark, Missouri the daughter of Lennie and Elva Shipman Smith. She was a longtime resident of the area and retired from retail sales at Silver Dollar City. She was a member of the Branson United Methodist Church. Survivors is a daughter; Tammy Stevens (Richard) of Harrison, Arkansas, two grandchildren, Bo Stevens and Paige Reed. She was preceded in death by her parents, her husband, Thomas Stanley Kerr and infant son, Danny Kerr, two sisters, Gracie Shelton and Edith Wimsatt, and four brothers, Junior Smith, Robert Smith, Bill Smith and Earl Smith. Visitation will be held at 9:30 until 10:30 the day of the services. To plant a memorial tree in honor of Mary Geneva Kerr (Smith), please visit our Heartfelt Sympathies Store.